We would like to give you three reasons why we think that Edwin van der Sar is the best fit for Manchester United’s new director of football position. Manchester United is still in the rebuilding phase after Jose Mourinho’s departure. The club wants to adapt to the modern game and is set to hire a director of football as a part of the process. One of the candidates for the job is their ex-goalkeeper Edwin van der Sar with Eric Cantona as his potential competition. The Frenchman’s Instagram post from 3 days ago has left Manchester United supporters convinced that he to be named the head of football at Old Trafford. Cantona joined United in 1992 and is one of the most influential players in the club’s history. In his first season, he delivered the league title for the Red Devils after a 26-year wait. Eric was club’s captain and spent five seasons on Old Trafford, winning the Premier League four times. In spite of the amazing history with the club, his controversial character, in our opinion, makes him a less suitable candidate than Edwin van der Sar. We would like to present you three reasons to support our theory that the Dutch goalkeeper would be the best choice for the director of football position at Manchester United. Edwin van der Sar has spent 6 seasons on Old Trafford and has worked with arguably the best manager of all times – Sir Alex Ferguson. 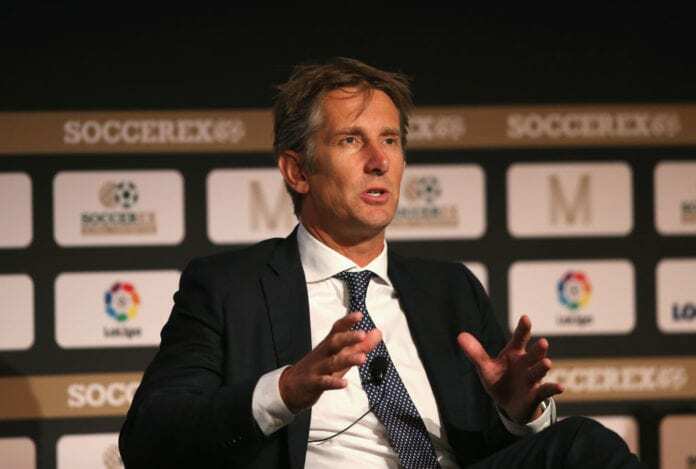 Van der Sar perfectly understands the club’s philosophy from the Ferguson-Gill period and that is exactly what Manchester United fans want from their new director of football. Van der Sar won the Premier League four times with the Red Devils. He won also the Champions League in 2008 in Moscow, making the winning penalty-save in the shootout against Chelsea. The 48-year old is the CEO of AFC Ajax at the moment. He started as marketing director in 2012 and was promoted to chief executive officer four years later. Edwin does a great job in Ajax, as the club reached the first European final in 21 years in 2017. Ajax also went through the group phase in the Champions League this season, where they will play against Real Madrid. Beyond the Europa League final, the biggest positive for Ajax has been the incredible transfer fees they have recouped with Edwin van der Sar as club’s CEO. They sold Arkadiusz Milik for €34 million, Davy Klaassen for €27m, Davinson Sanchez for €40m and just two weeks ago, Barcelona paid €75m to Ajax for Frenkie de Jong. Van der Sar is also responsible in the recruitment of club’s star Hakim Ziyech, along with David Neres, Dusan Tadic, Nicolas Tagliafico and the re-signing of Daley Blind. The football in Holland goes through a phase of a renaissance, as there are a lot of exciting Dutch talents in the past few years. Barcelona have used their good relationship with Ajax established in Johan Cruyff’s period in the club to get Frenkie de Jong. Matthijs de Ligt is another player with the potential to become a football star and he is ready to follow de Jong’s footsteps. Barcelona, again, is reported to be a favourite for signing the youngster, but there are several other European top clubs interested for him. There are many young and talented players in the Eredivisie that work their way up in the first team through the club’s academies. We believe that Edwin van der Sar is the man to help Manchester United get the most promising.